Is this the first post I've done about Avon on here? It can't be! I've been an Avon fan for so long, I really should review my Avon stuff more often. Anyway, one of the things I like most about Avon is the seasonal stuff they do every year. I always make sure to order the seasonal lip balms and bubble baths and the little tubes of hand cream they do with cute designs for each holiday. This year's fall lip balm collection is called Sweet Harvest and it consists of four flavored balms with some really pretty fall label designs. 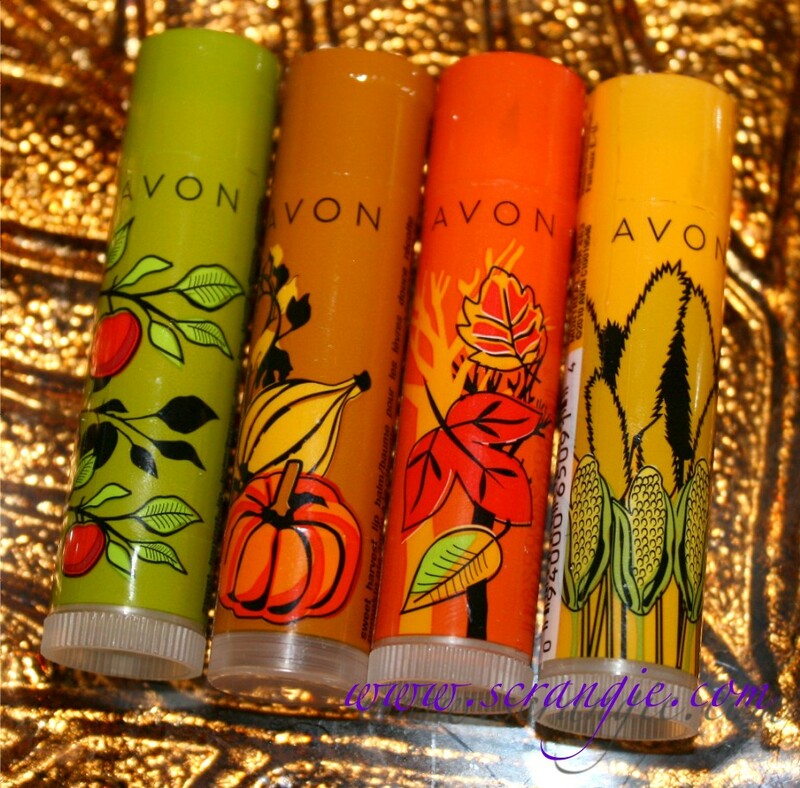 Avon Sweet Harvest balms in Sweet Almond, Pumpkin Pie, Candy Apple and Candy Corn. The balms have a slight tint to them but don't really add much color. Notice anything weird about that Pumpkin Pie Balm? The label is on upside down! I can't twist up the balm because it covers the base and it's hard to put the cap back on because of the label over the end. Kinda funny but a little frustrating because I don't want to remove the pretty pumpkin label to use my lip balm! They each smell like their names and have a bit of a sweet taste. The Pumpkin Pie one is usually my favorite and this year's version smells pretty good. The balms have a thick, sort of buttery waxy texture and moisturize fairly well. I'll admit, not the greatest balm formula I've ever used, but the scents and packaging are decent and the price is right (got mine on sale for 69¢). 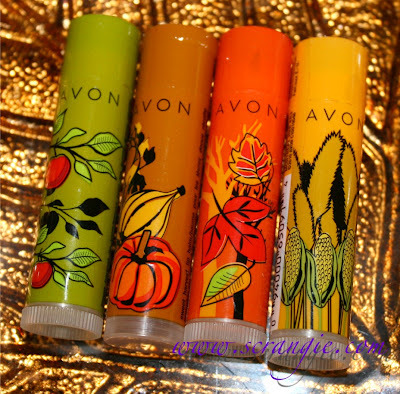 The one thing I really don't like about Avon's recent balm releases are the labels. They used to always have a colored cap and a printed label, but this year the label is one piece along the entire tube and is perforated at cap level. This means you break the label and leave a rough, ugly edge when removing the cap for the first time. Really wish they'd switch back to the old design which allowed the pretty labels to remain undamaged when removing the cap! I do love the designs they put on the labels this year. They remind me of old antique cookbooks and thanksgiving table decorations. Nail Designs xox, I never buy from a representative unless one of my friends is selling... too much hassle! I just order online, so much easier that way! Awww I just placed an order last week. :( Wish I would've gotten a couple of these scents/flavors. Those sound delicious. I might just have to order some of them. I love Pumpkin Pie! Mmm...I think the Pumpkin Pie one would be my favourite, too! Cute tubes, but the very idea of rubbing something that smells like candy corn right under my nose is kind of freaking me out -- and this from a girl who is straight-up ADDICTED to Dr Pepper Lip Smackers (but it's Dr Pepper! and they give such a nice dusky reddish tint!). My mom has been a rep for years, you can return that one as defective and you will get a new one! Eu compro sempre Avon aqui no Brasil, com uma representante. Vou ver se já chegou este Lip. 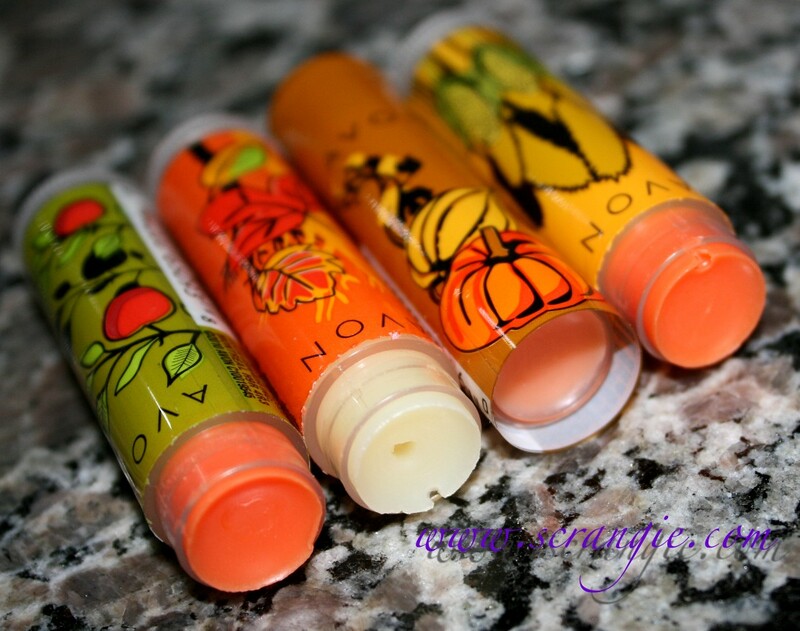 Love lip balms and they look delicious. I haven't bought Avon in 10 years or more.